*Syria has been in a state of violent unrest and civil war since 2011. It has also suffered a serious ISIS presence since the group took control of the Syrian city of Raqqa in 2014. The country is incredibly unsafe and all travel to any part of it is strongly advised against. Essentially, ancient history provided a fascinating backdrop to everyday life. Five-hundred-year old souqs were a significant part of this experience. A legacy of ancient trade routes, these bustling markets sold everything from handmade chunks of soap and carpets, to sheep's tongues. On the streets, donkeys, 1960s American car-taxis, bicycles, minibuses and private jeeps vied for priority, while street vendors and shoe-shiners clogged the sidewalks. 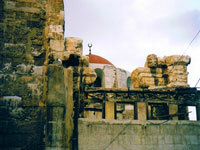 Damascus was of particular interest to travellers. As one of the oldest continuously-inhabited cities in the world, the capital brimmed with history. In the north, travellers celebrated the city of Aleppo for its medieval citadel (now in ruins), elaborately decorated hammans (bath houses), and ancient souq. It was also close to the ruins of St Simeon, perhaps one of the world's oldest churches. St Simeon is yet another casualty of the war. Syria remains an active war zone.